Satisfy your inner culture vulture at Sultanahmet District and Topkapi Palace. Head to Kapali Carsi and Istiklal Streetfor some retail therapy. There's still lots to do: contemplate the long history of Hagia Sophia Museum / Church (Ayasofya), contemplate in the serene atmosphere at Sultan Ahmed Mosque, delve into the distant past at Basilica Cistern, and browse the exhibits of Rumeli Fortress. For where to stay, other places to visit, and other tourist information, refer to the Istanbul trip site . Goiania, Brazil to Istanbul is an approximately 22.5-hour flight. You can also do a combination of bus and flight. The time zone difference moving from Brasilia Time to Eastern European Time is 6 hours. Expect colder temperatures when traveling from Goiania in April; daily highs in Istanbul reach 20°C and lows reach 9°C. Finish your sightseeing early on the 24th (Fri) to allow enough time to travel to Selcuk. An ideal base camp for exploring the Aegean coastline, Selcuk draws big tourist crowds due to its proximity to the ancient city of Ephesus. Start off your visit on the 25th (Sat): pause for some serene contemplation at Meryemana (The Virgin Mary's House), delve into the distant past at Bibliotheque de Celsus, delve into the distant past at Efes Antik Kenti Tiyatrosu, then explore the ancient world of Ancient City of Ephesus, then delve into the distant past at The Terrace Houses, and finally steep yourself in history at Public Latrine. Get ready for a full day of sightseeing on the 26th (Sun): see the interesting displays at Maket Koy, then get engrossed in the history at Turkish Bath Museum, then explore the ancient world of The Basilica of Saint John, and finally enjoy the sand and surf at Pamucak Beach. To find traveler tips, other places to visit, photos, and tourist information, go to the Selcuk day trip site . You can fly from Istanbul to Selcuk in 5 hours. Other options are to do a combination of shuttle and flight; or drive. While traveling from Istanbul, expect a bit warmer days and about the same nights in Selcuk, ranging from highs of 25°C to lows of 9°C. 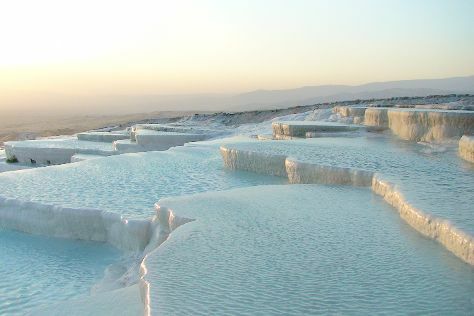 Finish up your sightseeing early on the 26th (Sun) so you can go by car to Pamukkale. A popular spa since the second century BCE, the modern city of Pamukkale continues to draw worldwide attention with its hot springs and travertines--naturally formed calcite bathing pools. Start off your visit on the 27th (Mon): explore the fascinating underground world of Kaklik Cave, then get outside with Pamukkale Balloons, and then take in the natural beauty of Cleopatra Pools. Keep things going the next day: take a memorable drive along Road to Pamukkale, then take in the natural beauty of Pamukkale Thermal Pools, and then explore the ancient world of Hierapolis & Pamukkale. To find reviews, other places to visit, maps, and tourist information, read Pamukkale trip itinerary planner. Getting from Selcuk to Pamukkale by car takes about 3 hours. Other options: take a train; or take a bus. Finish your sightseeing early on the 28th (Tue) so you can travel to Goreme. Famed for its landscape of unusually shaped stone formations and churches cut into the natural rocks, Goreme sits in the central part of the country, an area originally settled during Roman times. Get in touch with nature at Goreme National Park and Derinkuyu Yeralti Sehri. Goreme Acikhava Muzesi and Naile Art Gallery- Ebru Art Center will appeal to museum buffs. 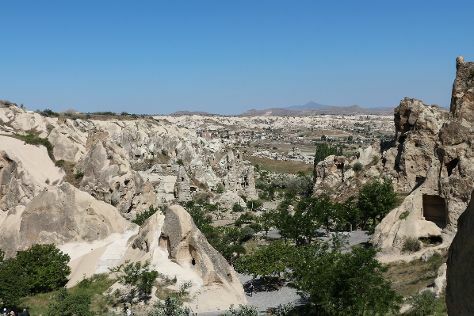 Next up on the itinerary: get interesting insight from Tours, Head underground at Cappadocia Cave Dwellings, and explore by horseback at Cemal Ranch Horse Riding Center. For more things to do, where to stay, photos, and tourist information, use the Goreme journey planner . You can do a combination of taxi and flight from Pamukkale to Goreme in 5.5 hours. Other options are to drive; or take a bus. In April, daily temperatures in Goreme can reach 22°C, while at night they dip to 5°C. Finish up your sightseeing early on the 1st (Fri) so you can travel to Abu Dhabi. Take a trip to Abu Dhabi to discover a modern metropolis built on a strip of land jutting out into the Persian Gulf. Kick off your visit on the 2nd (Sat): contemplate in the serene atmosphere at Sheikh Zayed Grand Mosque Center, then relax and rejuvenate at Emirates Palace, then contemplate the long history of Heritage Village, and finally enjoy the sand and surf at Corniche Beach. On your second day here, get in on the family fun at Ferrari World Abu Dhabi. 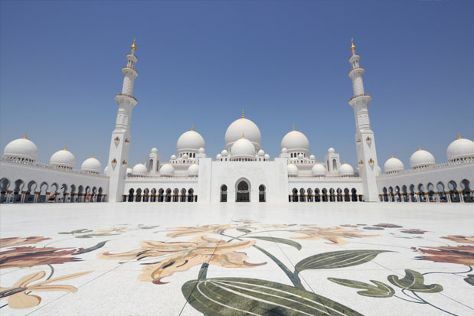 To see ratings, photos, where to stay, and tourist information, read Abu Dhabi trip site . Getting from Goreme to Abu Dhabi by flight takes about 10.5 hours. Other options: do a combination of bus and flight. The time zone difference when traveling from Goreme to Abu Dhabi is 1 hour. Expect warmer temperatures when traveling from Goreme in May; daily highs in Abu Dhabi reach 45°C and lows reach 32°C. Cap off your sightseeing on the 3rd (Sun) early enough to go by car to Dubai. Escape the urban bustle at Jumeirah Public Beach and Umm Suqeim Beach. Relax by the water at Marina Beach and Kite Beach. Spend the 5th (Tue) spotting exotic species with a safari tour. The adventure continues: buy something for everyone on your list at The Dubai Mall, cruise along Sheikh Zayed Road, stop by Gold Souk, and take an in-depth tour of Al Fahidi Fort. To find ratings, where to stay, traveler tips, and tourist information, use the Dubai road trip site . Traveling by car from Abu Dhabi to Dubai takes 1.5 hours. Alternatively, you can take a bus. In May, daytime highs in Dubai are 44°C, while nighttime lows are 32°C. Finish up your sightseeing early on the 7th (Thu) so you can travel back home.